Is a Leaky RV Getting You Down? Let us introduce you to this fabulous service. Water leaks caused by rain are one of the most difficult and costly problems for RV owners today. 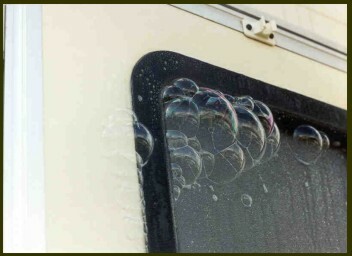 A leaking RV may cause unsightly stains, foul odors and tremendous structural damage to the unit. By the time most owners realize there is a problem, damage to the RV may be extreme, not to mention expensive to repair. Furthermore, rain leaks are not always easy to locate and may therefore persist even after repeated attempts to seal an offending area. We are excited to offer a service to help alleviate this problem. The SEALTECH 430R is an efficient and accurate way to check for leaks. This machine makes use of a very simple fact: air flowing through an opening covered with a soapy water solution produces a bubble precisely at the opening. The system draws outside air into the RV through the roof vent, where it is dispersed, creating positive interior pressure. This pressure difference causes air to flow outward through any outer skin faults. The application of a soapy water solution to suspicious areas of the outer skin results in a bubbles exactly over each fault. We can check your RV for leaks on our premises and give you a detailed report of problem areas. You can chose to repair the RV yourself or allow us to do it for you. Come in today and find out more about having your RV Sealteche. No Bubbles! No Troubles!